Trumpeter Rod McGaha has become such a prominent part of the Nashville jazz world that it seems he’s been here forever. But he actually grew up in the Windy City (Chicago). He was a student of the great Clark Terry during his days at DePaul University. He’s played with jazz stars like Kirk Whalum and the legendary Max Roach as part of his Brass Quintet, but with pop, soul, gospel and R&B luminaries like Lou Rawls, The O’Jays, Bebe and Cece Winans, and Take 6. Since moving with his family to Nashville in the early ’90s, he’s combined studio work with club appearances, solo projects and teaching. 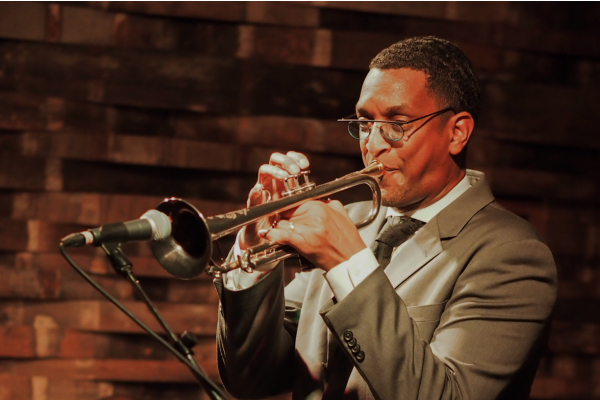 He currently teaches styles and improvisation classes at the Nashville Jazz Workshop and serves on their Advisory Board. He’s also becoming an in demand photographer, doing both stills and scenes. In advance of Sunday’s latest installment in the Tennessee Jazz and Blues Society’s Great Albums Concert, where he’ll be leading a group performing in its entirety the 1954 classic LP “Clifford Brown and Max Roach,” Rod took a few minutes to answer some of our questions. What initially got you interested in music and was trumpet your first instrument? Who would you consider influences? You’ve also worked in both Chicago and New York. What are the biggest differences in those places in regards to the jazz scene? What was it like playing with an icon like Max Roach? Did he ever talk to you about his experiences playing behind Clifford Brown or Booker Little? How has the Nashville jazz scene changed since you’ve been here, either positively or negatively? You’ve recently also gotten very much into photography. What attracted you to it, and what are your favorite types of photographic situations? You’ve done quite a bit of teaching. What are the most common problems that you see among aspiring musicians? What are some future goals professionally? Who are some musicians you’ve never worked with that you would enjoy doing a collaboration? Finally, would you consider yourself a pessimist or an optimist regarding jazz in the future?